rz, 26 May 2015The note 4 is laggy as hell. I had the note 3 and got used to it. When I ordered my note 4 I w... moreI quit bying Samsung coz of their laggy software. I had s2, s3, s4, s5... Now Im om Xperia Z3 for two years, no lag at all. Its working even faster and smoother. No heavy skins or layers over standard android and i like it that way. Stock Android is the best for heavyweight users like me. Like it or not. Nexus 6 is better as far as I know. Considering the price it is. Not seen a single Samsung phone that doesn't hang after 5 months. I've had a nexus 5 for 2 years. Never hangs!! Not even a bit. I'm very sloppy with phones and cracked its screen. Have barely 200mb space remaining. Full of apps. And never hangs. That's the best part. We need phones that work smoothly. Speed. Is all that matters. Not features or speakers of screen. All those stuff depend on how rashly u use the phone. But internally. Nexus 6 wins!! I haven't seen Nexus sold either in Europe nor in Asia - on any website or in any store. (Isn't that just a domestic U.S. brand?) Now visiting China. Can't even access their website because Google doesn't operate in the world's largest market. That says a lot. Yoooo stopped reading after they gave a draw on the speakers because the Note is louder. LMAO front facing speakers are a big reason I am interested in this phone and a massive advantage over the Note imo. The note 4 is laggy as hell. I had the note 3 and got used to it. When I ordered my note 4 I was expecting this 8 core monster to be snappy as a dragon(get it? ), but it wasn't. Im not going to say it couldnt handle the load im saying it was just slow. You press the home button and there was always a delay. You press the recent apps button and theres a delay. Theres always a delay with the note 4. I like to move quickly and anytime you want to switch to another app you have that dreaded delay. I felt ripped off because my note 3 was performing just as quickly. It didnt feel like much of an upgrade so I ordered a nexus 6 and to be honest im much happier with it. I know im missing out on some cool things I had on the Note, but to me this huge improvement with the response made it all worth it..I actually feel like I have a fast phone now. Performance, everything seems the same. But response times, wew. I like this. Oh and you cant forget that the Nexus is rootable. yes you can root the Note 4, but have fun tripping KNOX and voiding your warranty! Sounds like apple ;) later. There's Samsung fans and Motorola (or Nexus) fans. 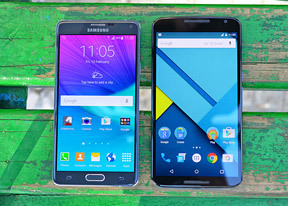 Yes,the Note 4 is a better phone with awesome display and so many features,no doubt! Ok,but I'm a mountain biker - who do you think I prefer? All I need is a basic water resistance,good sound,mapping and non of all flashy features.Plus I'm a Motorola fan from 15 years. Owning and using both devices currently i think the Note 4 is the better device. The only advantages the Nexus 6 has are the speakers sound better, (the Note 4's is louder) the larger screen and the frequent updates to the latest Android. The Note 4 has a removable battery and MicroSD slot, gets better battery life, has a brighter screen, takes better photos especially indoors and has way better placement of the power button. Putting the power button right next to the volume buttons makes no sense whatsoever as without looking it's hard to tell which button you are pressing. The Note 4 has a heart rate monitor, infrared port to use as a remote and a ton of extra features. If the Note 5 will end up having a larger screen and dual front facing speakers it would be perfect and I'd probably sell the Nexus 6. AnonD-7433, 28 Feb 2015O wow.. Isn't that exactly what I said? "The Nexus 6 is the best phone for you and the No... moreI see you kids are still arguing the toss! So the rest of the world all use the Note 4, right? Each person has different needs and what I do not need are gimmicky functions that are fine if that is what you want but I prefer my interface clean, quick updates, a good camera and overall functionality, excellent screen etc. I do not need the best phone but I do need a good phone and believe me I have used them all and by that I am including, G3, S5, Xperia Z3 and the iPhone too whilst we are at it at various times and sometimes together. For whatever reason the Nexus 6 just does it..for the time being although I may partner it up with the G4 should it be even better than the G3. The Note does not float my boat and therefore it is not the best phone in my opinion and that is not changing anytime soon. As I say, the Nexus may arguably not be the best phone, from an objective point of view, but from a subjective one, it sure as hell is! Now fan boys can flame all they want, you will be wasting your time, mine is valuable so absolutely disengaging unless someone out there makes a point that gets my respect. If I do not respond to you, it is because I think you do not have a valid point to make worth my time! TheNeighbor, 01 Mar 2015Similar arguments for iPhone users - this is all I need. Exactly! Every Android users has to defend the same things to iOS users. Blah blah my phone does less because I don't need those features so I don't care. And mine performs better because it's simple. Yours just lags blah blah. Every which way you turn it's whiny children. Slayer, 27 Feb 2015Not very bright are you? Do you understand about individual preferences? My preference is for ... moreSimilar arguments for iPhone users - this is all I need.